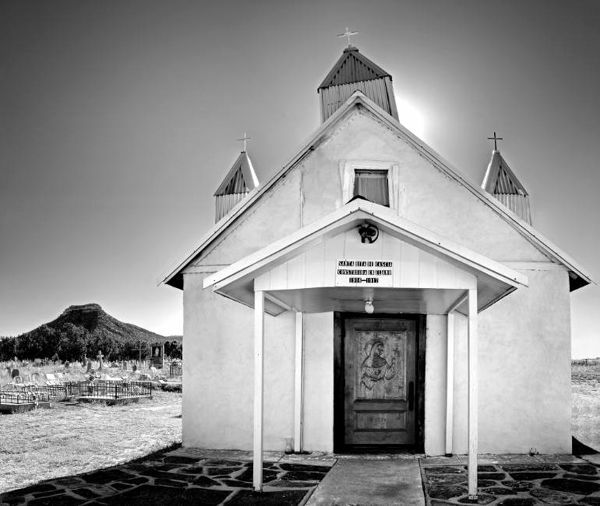 Sitting in the shadow of Starvation Peak, Los Cerritos de Bernal, got its start in November 1794 when Lorenzo Marquez, for himself and on behalf of 51 other Santa Fe families, asked Spanish Governor Fernando Chacón to make them a grant of lands at a place called El Vado, and the surrounding area. 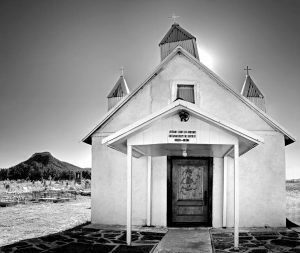 The San Miguel del Vado Land Grant of 315,000 acres was approved and soon a number of new communities were established in the Pecos River Valley, including Bernal. The village sits on the west bank of Bernal Creek on the south side of I-25, at exit 330. 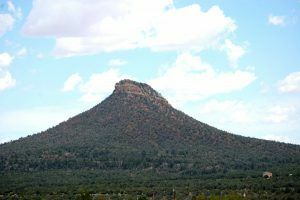 There is a legend to the name of “Starvation Peak” which says that during the Spanish colonial period, a group of hostile Indians drove some 36 people to the top of this mesa where they were either killed or died of thirst and starvation. This story was documented in by a traveling reporter in an 1884 edition of the Detroit Free Press. Over the years, the story “grew” and by 1939, when writers from the Works Progress Administration were documenting the region, the number of colonists had grown to 120. Though there is no evidence to support this tale, the butte has been called Starvation Peak for well over a century. Despite this early traffic along the Santa Fe Trail, Bernal appears to have never grown very big. Making matters worse, when the Atchison, Topeka and Santa Fe Railroad built laid its tracks through the region in the early 1880s, it built its station 1.5 miles east of Bernal. The station was first called Bernal, but later renamed Chapelle. Another small community called Chapelle grew around the train station. Bernal had a post office intermittently between 1881-1895. The Capia de Santa Rita de Cascia (Santa Rita Chapel) was built of stone in 1916. It continues to serve a congregation today. It and the Bernal Store are the only buildings in Bernal, with the exception of few houses. In 1926, Route 66 came through the community but was rerouted in 1937. Sections of the Santa Fe Trail probably ran due west of Starvation Peak to San Miguel del Vado, a major stop on the Santa Fe Trail. 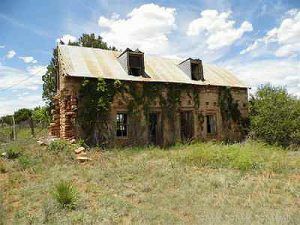 However, today’s traveler must return to I-25 and travel seven miles west to Exit 323 and then travel south 2.4 miles south on New Mexico Highway 3 through the village of Ribera to reach the San Miguel Del Vado National Historic District. Route 66, in its short life through the region, did not pass through San Miguel Del Vado, instead, it made a direct path from Bernal to San Jose some ten miles west of Bernal along I-25.